The foam roller is an excellent sporting equipment that you should acquire. Its primary function is to help muscle recovery, in addition to improving elasticity and range of motion. It is an amazing little tool and has high impact on your sports performance. In recent years, the use of the foam roller has become widespread. At the time it was a self-massage technique used only by professional athletes, coaches, and therapists; but currently, the foam roller is an everyday practice for athletes at all levels of fitness. Our muscles and organs are surrounded by “fascia,” a very resistant connective tissue that gives support and protection to the whole organisms. Using the foam roller helps to keep the fascia in good condition because it allows greater oxygenation and circulation of blood in the muscles. You can easily foam roll shoulders and more to find relief! Do you want relief from shoulders and neck pain? Then keep on reading to learn more about what foam rolling can do for you. The foam roller is also called myofascial release. What is fascia? And why is it so important to release it? The fascia is the thin tissue that connects your muscles. Think of it as the internal packaging of your body: it helps the muscle groups to cooperate as integrated units. When you are healthy, the fascia is flexible and slides smoothly over your muscles. But the overload in your fascia can be formed for a variety of reasons, such as muscle injuries, inactivity, illness, inflammation or trauma. Sitting in front of a desk all day can cause your fascia to “stick” and stiffen. A foam roller is a cylinder usually made of foam or flexible plastic that can be placed in a variety of positions, allowing your body weight to exert intense pressure on the affected muscle groups. The better the fascia stays in the body, the better you will move, and the better your sports performance will be.Thus, this recovery therapy can reduce the possibility of post-workout injuries and pain, increase your flexibility, improve your range of motion, improve your athletic performance, accelerate the recovery times of an injury, and release muscle tension. There is a reason for the popularity of the foam roller: this self-massage technique is simple and works. There are a number of reasons why you might consider foam rolling. Here are just a few of them. The foam roller is a tool to obtain a self-myofascial release. Which allows the normal flow of blood to return to the muscles and restore tissue. This is because it targets specific areas with a benefit almost immediately. Lactic acid can cause cramping, pain, heaviness, and burning. The rolling foam releases the accumulation of said acid and manages to maintain the body optimally. When you have a negative muscle tension, it can cause the body to be rigid for a long time. 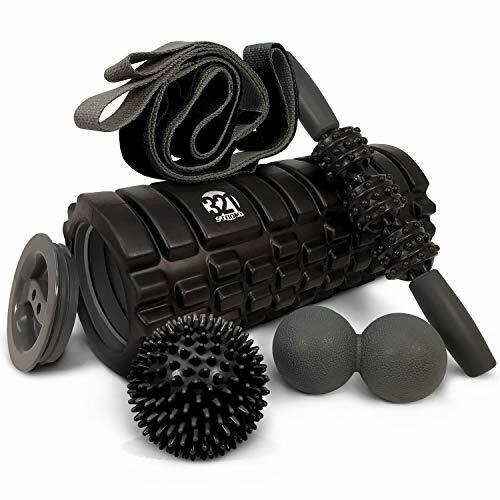 These rollers can make the muscles more receptive and they will help keep those muscles moving. So, that they work efficiently and thereby improve flexibility in general. Thanks to the foam roller you can release the pressure points that usually cause discomfort, relaxing the contracted muscles as if it were a massage. Remember that a bit of pain is right, but this does not mean that tolerance to pain should be put to the test. Having a good blood flow can help eliminate toxins from the muscles, which means that the foam roller helps minimize the appearance of cellulite significantly. Place the roller on the affected area and remember, it is better to be soft than too hard. You can feel sensitivity when going through the tissue, but it should not be agonizing. You’ll want to press hard enough to release the fascia, but you shouldn’t bruise yourself for example. To be straightforward, it is useful to divide the muscle you are working into three segments: lower, middle and upper. Give each section adequate passes up and down, go to the next part, and then end with giving a pass to the entire length of your muscle. With each step through the muscle group, you can work more in-depth into the tissue for more significant release. You will find several trigger points throughout the body. When you reach an especially painful or tight point, pause and try to relax. Take a moment, and the muscle should be released. For more precise areas, go with something more advanced. As you get to test your body and how it responds to foam rolling, you can go more in-depth as needed. Foam Rolling for Shoulders and Neck. When to do Foam Rolling? The foam roller can be used before and after your workouts. Before exercise, tissue elasticity, the range of motion and circulation (blood flow) will increase. This can help you move better in your training and protect you from injuries. Learn more here: When is the Best Time to Foam Roll? The foam roller after training is an excellent way to improve recovery. Concentrate on all the major muscles you just worked with, with an additional emphasis on the areas that you feel problematic. Stimulating the blood movement in the affected areas will dramatically increase oxygen to the sore muscle fibers and reduce the recovery time. Most elite cyclists receive regular massage for this reason. While nothing can replace a good sports massage, you can enjoy many of the same benefits at home (or between massages) with a foam roller. The Foam Roller can be used both in the warm-up and in the elongation after the training, applying the pressure in all the muscle groups that you worked on that day. Also, it would be a mistake to consider the foam roller only as an occasional tool. If used every day, even for a few minutes, it will help you avoid muscle problems. As a recommendation, avoid passing it too quickly. The movements with the foam roller should be slow and deliberate. If you move it too fast, the muscles will not have time to adjust and control the compression. As for the pressure that will be exerted, it will depend on each one, depending on our body weight, but in no case, that pressure must be painful. Also, if there is swelling in any muscle, it is recommended NOT to apply pressure with the roller directly. What’s your Top Pick for Foam Roller for Shoulders and Neck Pain? That’s a great question and we’re happy that you asked. There are an almost overwhelming number of choices for foam rollers on the market today. It can be very difficult to choose the best one for your needs. However, one of our top picks is the Rumble Roller. It’s very firm, but it has nubs on it that help to make it less painful. They also assist the roller with getting into all those little nooks and crannies. Besides that, it’s very reasonably priced and also has some of the best user reviews and ratings among all items on the market today. It really is that good. Maybe you’re kind of like me and get very tight around your shoulder blades. It can be quite difficult to get in there all the way with someone as large as a foam roller. That’s where a massage ball can come in handy. While it’s ideal to have someone else release these muscles in your shoulder blades for you, it’s also possible to do it yourself when laying on the floor or leaning against a wall. Are there Other Things I Can Do to Reduce Shoulder and Neck Pain? Sitting all the time is hard on our bodies. We drive to work, sit at desks all day long, drive home, sit down and eat dinner and then relax in front of the TV for a few hours at night. Spend at least some of that time standing up to relieve pressure on your back, shoulders and neck. That said, standing all the time can be tough on the legs, so ideally, you’d do a mix of both of them throughout the day. Consider a desk that can be adjusted to either sitting or standing position. Or, use a standing desk and then have a small table with chair next to it to use throughout the day. Many people spend the day looking down at their computer screens. This is very hard on your neck and shoulders. Raise up your screen by putting it on a box of some kind. Or, if you use a laptop, consider getting an external keyboard and putting the screen on a stand of some kind. If you talk on the phone all the time, consider getting a headset instead of holding the phone up to your ear. This is particularly true if you cradle the phone with your neck. If you don’t normally experience shoulder and neck pain but suddenly now are, it may be that your pillow isn’t giving you the support you need. Try a new one and see if that helps prevent neck and shoulder pain. This is particularly true if you often wake up with a kink in your neck. Dehydration is bad for all kinds of things that happen in our body, including our spine. The discs in your vertebrae require water to stay elastic and spongy. When they dry out a little bit, your vertebrae can compress and cause some pain. Do you have any go-to exercises that help to relieve shoulder and neck pain? Leave a comment below and let us know what you think.